Private health insurance companies are required to abide by certain laws that protect policyholders from being unfairly denied coverage. Over the years, the Employee Retirement Income Security Act (ERISA) has been amended to provide further protection for those who may be at risk of being denied coverage because of their health condition or medical history. One of the most significant amendments to ERISA is the federal Health Insurance Portability and Accountability Act (HIPAA), passed in 1996. Prior to the passing of the HIPAA, many employees and their families were being denied the health coverage that they needed because of factors that were outside of their control. The HIPAA helped to establish certain limitations to denying health coverage. The law specifically protects employees with health coverage from being denied their coverage because of a preexisting condition. This protection also extends to other beneficiaries listed on the employee’s plan, such as immediate family members. While the passing of the HIPAA made it illegal for health insurance providers to deny coverage to employees with a history of medical issues, some companies still try to do so. The only way to see that your insurance rights are protected is to take legal action against an uncooperative provider. Our Indiana ERISA lawyers understand how important health coverage is to you and your family. We can help you initiate your lawsuit to enforce the law under the HIPAA and protect your right to health insurance coverage. Do not let your health insurer get away with denying you the coverage that you are entitled to. 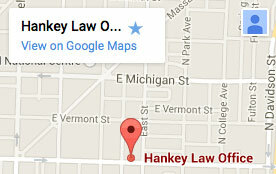 For legal assistance, contact the Indiana ERISA lawsuit attorneys of Hankey Law Office, by calling (800) 520-3633.